Ladies: Please wear pants in Crown Heights. And sleeves. Consider a smart blazer, too. 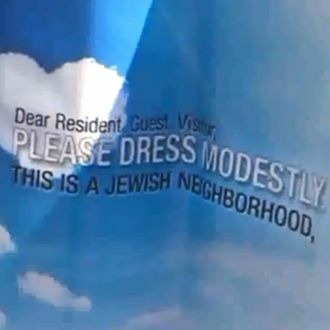 As long as you dress modestly, the people who posted a handful of signs around a Hasidic section of the rapidly gentrifying Brooklyn neighborhood will be happy. According to the Brooklyn Reader, these signs have recently popped up, as they have in Williamsburg and other changing NYC areas for years, and are part of a broader “movement to dress more conservatively … as a show of increased solidarity for the conflict in Israel.” Don’t tell that to the women around the neighborhood, though. None of those whom PIX 11 talked to were onboard at all.